Free Spirit is beautiful example of the timeless beauty of a 48' Krogen Widebody. She has been well-cared for by her owners and is ready to take you anywhere in the world you choose to roam. 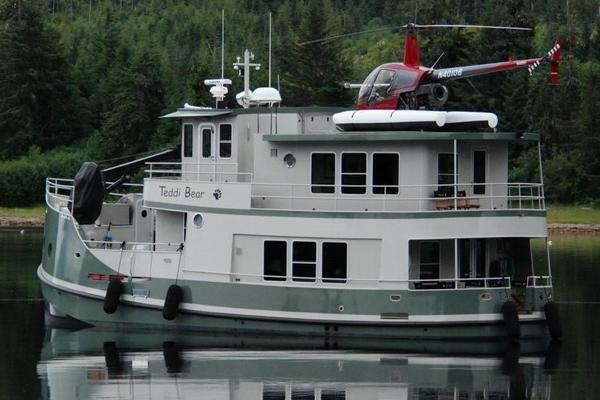 She is the perfect liveaboard boat for a couple and is only available due to a change in her owner's plans. The saloon is entered from the fully covered back deck through two large teak doors with windows. To starboard there is a large u-shaped settee in custom Ultra Suede. The teak dining table opens up to seat six people comfortably or up to ten using some extra chairs. To port are two Lazy-Boy reclining chairs with two granite-topped teak end tables. Storage behind the recliners includes sliding door lockers and three drawers. Forward of the chairs to port is a built-in book shelf with granite topped bar/desk area with custom LED rope lights. There is a large wine cooler under the bar. Two opening side windows and two fixed aft windows are complimented with teak valances and custom 2" teak blinds. These windows let in ample light and ventilation. There are beautiful teak parquet floors. The guest stateroom/office is down three steps from the galley and to starboard. There is a built in desk. The Ultra leather settee converts to a double bed and there is a pullman berth to accommodate additional guests. A large hanging locker and drawer storage provide extensive storage. Three large opening ports keep it bright and airy. For additional light and air to the rest of the boat there is a large opening in the bulkhead to the companionway with a custom made shade for privacy when this stateroom is used for guests. The guest head is on the port side opposite the Guest Stateroom/Office. It has a stall shower with molded seat, Corian counters and new Raritan Elegance toilet installed in 2014. There are several lockers for storage and two opening portholes. The GE stack washer/dryer is also located in the guest head. The master stateroom is forward of the guest stateroom. It features a centerline island queen-sized berth. There is a Vizio TV for entertainment. A mirrored and lighted vanity as well as three hanging lockers and generous drawers provide ample storage. Four opening ports and two overhead hatches provide ventilation for those peaceful nights at anchor. The master stateroom head is located on the port side of the stateroom. It features a new Raritan Elegance Electric toilet installed in 2014, stall shower with shower door and molded seat, and Corian countertop. There are two large cabinets for storage. A bright LED light over sink and two opening portholes make the room bright and airy. The pilothouse is up custom steps with handrail from the saloon. It offers excellent visibility though large windows and opening portholes. Pilothouse windows have Textiline covers to keep the pilothouse cool during the day while still allowing you to see out. There is a comfortable white leather Stidd helm chair for the captain and a comfortable L-shaped settee in custom navy fabric for additional seating. The settee converts to a double berth. Teak doors to port and starboard allow for easy access to the deck. Two overhead screened hatches provide additional airflow and light. There is generous storage in lockers and drawers. • VHFs (2): Garmin 300, Standard Horizon Model?